Herald-Post collection, University of Louisville Photographic Archives. All wav files are played by Charles Moll and used by permission from Frederick Military Academy and the copyright holder. Originating from a drum call more than two centuries ago, Reveille was intended to rouse soldiers for the duty day and notify sentries to cease night challenging, In 1812, Reveille was a drum call, but as time passed it came to mark when the flag was raised in the morning and honors paid to it, Since it is no longer only a call for soldiers to rise in the morning, it is proper for all military and civilian personnel to afford honors to the flag during these ceremonies." 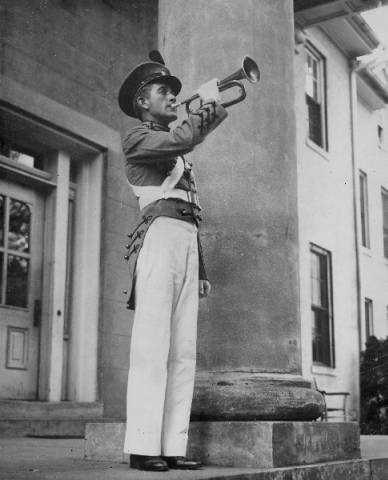 "Retreat takes place at 6 p.m. (5 p.m. during late fall and winter) each day with a cannon firing and the playing of the National Anthem or the bugle call "To the Colors" if a band is not available,"
The European traditions of Reveille and Retreat were imported to this country, but the bugle calls played today bear little or no likeness to those used by our European counterparts." This information was provided by Staff Sgt. Nicholes Dyer, Honor Guard Platoon. This story, of course, rates up there with the one that Colonel Oliver North tried to warn us about Osama Bin Laden during Congressional hearings, the one that Lee Marvin and Captain Kangaroo (Bob Keeshan) met as Marines on Iwo Jima, and the one about a Vietnam POW being ratted out by Jane Fonda on her visit to Hanoi. It is a yet another MYTH that makes it way around thanks to the Internet. Bad history, and we get to see a lot of it, needs to be corrected. The story of Captain Robert Ellicombe and his Confederate son is a myth, a fake, a tall tale, a good story to tell around the old campfire, but a story that holds no truth whatsoever. This is one of those stories that is reprinted and forwarded to others and makes its way around the Internet around Memorial Day, Independence Day and Veterans Day. 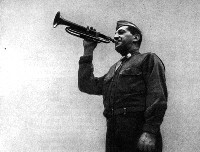 The story gets printed in papers, newsletters, and, sad to say, even on some military websites as the true version of how the bugle call of Taps came into existence. Taps Exhibit at Arlington National Cemetery and am a Civil War reenactor. I, along with other history buffs, have researched the real story and have tried to squash this myth. We in the United States have all heard the haunting song, 'Taps.' It's the song that gives us that lump in our throats and usually tears in our eyes. But, do you know the story behind the song? If not, I think you will be interested to find out about its humble beginnings. Reportedly, it all began in 1862 during the Civil War, when Union Army Captain Robert Ellicombe was with his men near Harrison's Landing in Virginia. The Confederate Army was on the other side of the narrow strip of land. But, out of respect for the father, they did say they could give him only one musician. The Captain chose a bugler. He asked the bugler to play a series of musical notes he had found on a piece of paper in the pocket of the dead youth's uniform. This wish was granted. The haunting melody we now know as 'Taps' used at military funerals was born." So where did this myth come from? I have traced this tale to a Ripley’s “Believe It Or Not” story that Robert Ripley created for his short-lived TV program in 1949. This is chronicled in the book Ripley, the Modern Marco Polo: The Life and Times of the Creator of “Believe It Or Not” by Bob Considine, published by Doubleday & Co. in 1961. As Considine wrote: "The denouement of this is a coincidence incredible even by Rip’s standards." 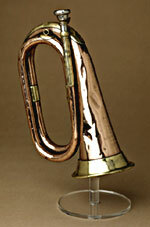 The bugle call sounded at retreat was first used in the French Army and dates back to the crusades. When you hear it, you are listening to a beautiful melody that has come to symbolize the finest qualities of the soldiers of nearly 900 years. Retreat has always been at sunset and its purpose was to notify the sentries to start challenging until sunrise, and to tell the rank and file to go to their quarters and stay there. In our times the ceremony remains as a tradition. When you are outdoors and hear retreat played, you face toward the flag if you can see it and stand at parade rest. If the flag is not within sight. then face toward the music. Retreat is a daily ceremony held at all army installations as the national flag is lowered at the end of the work day. It is scheduled at a definite time in late afternoon: the precise time left to the discretion of the installation commander. At fort monmouth the time designated is 1700 hours (5:00 pm). The ceremonies of retreat in the afternoon, coupled with reveille in the morning constitute a dignified homage to the national flag from its raising to its lowering. The bugle call "retreat" is sounded just before the actual lowering of the flag. At the last note of this call, a cannon is fired. Then, if a band is present, the national anthem will be rendered. In the absence of a band, the bugle call "to the colors" is substituted. As the anthem, or "to the colors" is sounded, the flag is lowered. The lowering of the flag will be regulated so as to be completed with the last note of the music. All personnel within sight or sound of the ceremony will come to attention and render the appropriate salute, facing the flag. Vehicular traffic will come to a halt, and the driver or individual in charge of the vehicle will dismount to render honors. The retreat ceremony is known to have been in use in the American army since the revolutionary war. At that time it was sounded by drums-the normal musical instrument found in the infantry units of that period. The history of the evening gun is much older. Initially it was not connected with a flag lowering. One legend has it that it was initially fired to drive away evil spirits. That would put its origin back in the middle ages when gunpowder was introduced into europe, and much earlier in the orient. It seems logical in more modern times that the firing of a gun near sunset was intended to call the troops back to the fort or camp from their fatigue duties of the day. The booming of the cannon could be heard at a greater distance than the sound of either drum or bugle. Finally, a parade can be held in conjunction with the retreat ceremony. The combination of ranks of smartly uniformed troops, the sound of the evening gun and the band playing the national anthem constitutes one of the most inspiring of United States Army ceremonies.